it's got a secret stash of Bully Sticks, freeze dried chicken, and margarita mixers! Aye....Speedy Buccaneer is one sheet to the wind....goin' for THREE! awwhoy speedy buccaneer!!! let's ride da waves of da 7 seas to find a lot of trashures! It sounds like your treasure chest is worth breaking into, Ruby! Please don't make me walk the plank! May the booty all be yummy! 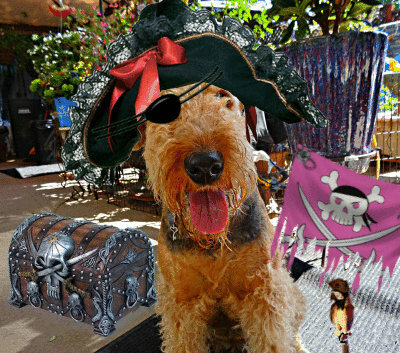 BOL...We are all for meetin' ya at that there Inn for a pint of 3 of rum!! Wow! Your treasure chest sounds like something I should have too. Right now, all of my prized squeaky toys are in a basket that anybody can get into. Ruby I am 100% convinced you can do anything be anyone you set you mind to be. You reminded us of a joke this morning! "On the sides of my buckin' head." Aye me lady! Ye is looking quite fetching and we don't mean tennis balls! Bahaha! Sorry, we've had a bit o' grog. Every good pirate needs a stash of margarita mixers. Ahoy Speedy Buccaneer! Wow, Speedy Buccaneer is quite a name... but you are quite a pirate!!!! You cast such an adorable pirate, Ruby!